Nintendo of America has now confirmed that this app will be released in North America — it'll arrive in the region on 2nd December and cost $19.99. Way back in Spring 2012 we told you about the official Louvre 3DS tour guide application that was being offered to visitors of the iconic museum in the French capital. Today Nintendo has announced Nintendo 3DS Guide: Louvre for the 3DS eShop, and also released one of its most charming mini Nintendo Direct videos as an accompaniment. The app will be available from today in Europe and will cost €19.99 / £17.99 to download. It recreates the same experience of the guide in the museum itself, utilising the 3D screen in particular to provide views and images of all of the major areas of the site — this includes "600 images of artwork, nearly 30 hours of audio commentary, and more than 400 photos of the museum interior including 360° panoramic 3D photos of gallery spaces". There's an interactive map, set tours such as the Family Tour and a Slide Show feature that you can set to display chosen images with a clock — rather like a stylish wallpaper for the 3DS. The app will update with latest exhibit information just like those official units in the museum, and it means you can also use your own 3DS for the interactive guide if you ever visit the venue itself. Physical copies of the software are also available from the museum's gift shop, if you dislike download copies and fancy a trip to Paris. 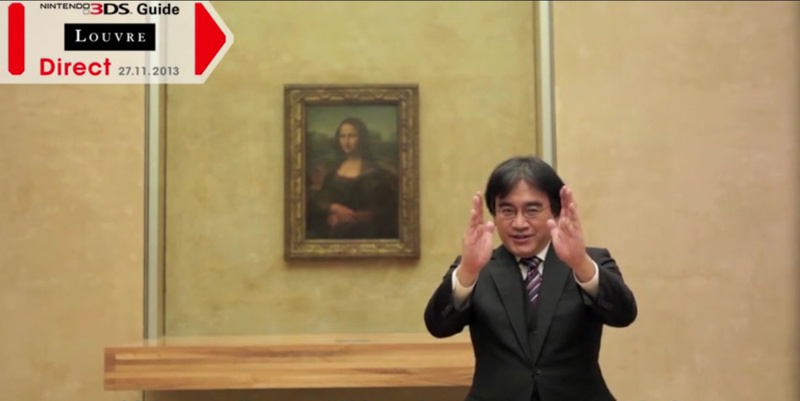 Whether the app is inspiring your artistic side or not, the Nintendo Direct video below is a must-watch, as Satoru Iwata and Shigeru Miyamoto tour the museum and put the guide through its paces. We'll keep an eye out to see whether this app will also be released in North America. I went to the Louvre like 6 time per year at school, so nope. What a lovely and unique piece for the 3DS. . I shall be downloading this. I might get this. Shame it wasn't for WiiU - would've been perfect for a new 'panorama view' app. O well. Nintendo is getting more and more software to compensate with the App software in smartphones. And people thought Nintendo is doomed. I feel like people are goin to buy the physical copies and sell them for a ton of money on eBay. NINTENDO IS GOING NEXT LEVEL!!! This is next Gen!! it's all about the experience. I'd like this to come to North America. But until then, I guess I can appreciate the Winged Victory of Samothrace in 3D in Animal Crossing: New Leaf, but its low poly model/textures don't do it any justice. Besides that, I think I bought the fake version! Great, now i can visit Louvre on an awful-res screen and a battery life of minus 5 hours. Yes, this is next gen. I guess it was nice that this is released here in Australia as well, but it does cost then basically nothing to do so so that's probably why. Anyway, now I feel like playing Rhythm Thief again! Do get this if you have any interest in art or history (and especially if you plan on visiting the Louvre at some point). The Louvre is full with artworks and items that are relevant for mankind's cultural history. Besides the obvious masterpieces, you have stuff such as the 3700 years-old Babylonian stone inscribed with the Code of Hammurabi, one of the earliest records of laws governing civilized society. And many, many other interesting things. This program is best used at home, in my opinion. There's a lot of information on the screen that you won't use when you are actually in front of the artwork, as you won't really bother to rotate in 3D a model of the statue when you can just move around the real exhibit. But when you're at home, then you can take you time to do just that. The commentary is very good, because it doesn't just give you some historical background, but it also tells you how to look at a work of art and why it is worth anything. It's cool that you can take your 3DS to the Louvre and start using it as a guide. It costs 5 euros to rent a guide there anyway. One of the brilliant features is that you can choose the works that you want to see, and then the program will calculate a route through the museum. This is a fantastic idea. However, we lost more than an hour getting lost through the Louvre the first time when we went there. The on-screen indications are very unclear. The icons on the map are quite confusing - you simply can't tell where you are. And if you get lost, then the device will recalculate your position and will not tell you that you are going in the opposite direction (or that you are even in the wrong wing). So, to sum up, great content but the automatic map has some unresolved issues. Awesome, I wish this would come to NA since I have no chance of going there. Pretty neat sounding app, although the price point struck me as a bit high until I read all of the features and content. I'd love to see something like this in NA at maybe the Smithsonian. It just looks soooo different to every other experience in games that I feel like I'm getting pulled into it, despite it not being a game. $26 to check out the whole (or most at least) of the Louvre Museum from my couch at any time AND see the sculptures from different angles that you normally wouldn't see? Yes please! Possibly buy it next year though. I would love to have this here in NA. I'll never get to France but I've always wanted to tour the Louvre. Very interesting. I'd make a purchase should it become available here. I could have made great use of this in college. Certainly would have helped with Art History III, at least. Being an artist who unfortunately will most likely never get to the Louvre myself... (yes, there are still "starving artists" in the world ) I would love to see this in the USA. I would be willing to spend the 25 bucks for this as a download . Perhaps I should email NINTENDO? I want this in the US. REALLY! I would buy this if it came to NA. Very cool my mother will love this and my self its great to hear what the artist was thinking at the time and the way the brush strokes where done. Its such a pitty you cant get the game case from the official nintendo shop. Definitely getting it coming the 2nd. and Quoting, @Yenly, this is indeed next gen. It is all about the experience. @yenly Totally with you. It is all about the experience. Shouldn't that read: "Don't mona 'bout the price"? I think I was there in 93, one of those 13 cities in 13 days tours where you drink so much and suffer so much from jet lag that after you get back home you can't recall any of it except for the cute red-head who kissed you once but said no more b/c she was engaged to some guy back home. Anyway, $20 on the 3DS while they are pushing the $99 2D only 2DS to kids seems like a conflict of interest. Should have been on the Wii U for $20 where I can view this stuff in 1080p (well when the 1080p feels like working). It does sound more like something that should be used in classrooms rather than being owned personally. I love Mr Miyamoto's enthusiasm, and how Mr Iwata can't pronounce the 'r' sound. Looks a great app. I would prefer the physical copy but I can't see me visiting Paris anytime soon. Sweet! Well worth it to me anyway. Interesting, but not willing to drop £18 on this. Good Idea. I used the app at the museum, when I was Paris earlier this year. @Bliquid Good thing i got my 3DS XL with almost twice of battery life, Yeah!